For other people named James Murphy, see James Murphy (disambiguation). James Anthony Murphy (September 12, 1894 – September 15, 1924) was an American race car driver who won the 1921 French Grand Prix, the 1922 Indianapolis 500, and the American Racing Championship in 1922 and 1924. Murphy, who began his racing career as a riding mechanic, is shown here with his own mechanic at Tacoma Speedway in 1922. Muphy was born in San Francisco, California, on Minna Street, between 7th and 8th, in September 1894. His parents were Irish immigrants who owned a fuel and feed store which fronted on Mission Street behind the family home on Minna. This area of San Francisco was called "South of the Slot" by locals in those days, and comprised a sprawling ghetto of mostly Irish immigrants and their children who made up the majority of the local labor force. Murphy's mother died during the April 18 1906 San Francisco earthquake and fire. Murphy's father left him in the care of his cousin, San Francisco firefighter Lt. Tom Murphy (later to become San Francisco's fire chief and recognized as one of the pioneers of modern firefighting in San Francisco), and his wife Catherine. There are no records as to the whereabouts or fate of Murphy's father after 1906; it was not unusual in those days for single fathers to leave their children in the care of relatives and go "traveling", hopefully to find a new wife. Murphy lived with Tom and Catherine and their five children in a house in the Hayes Valley neighborhood of San Francisco until late 1907, when Murphy's mother's brother-in-law, Judge Martin O'Donnell of Vernon, California (now part of East Los Angeles), sent for Jimmy to come live with him. In Southern California Murphy attended Huntington Park High School and commuted to and from school on a motorcycle given him by Judge O'Donnell. He became an expert rider and mechanic and, a few months short of graduation, opened a garage with a friend, developing a clientele of motorcycle and automobile owners from the Los Angeles area. Murphy began his racing career as a riding mechanic, back in the days when racing cars carried a driver and a "mechanician." He rode in winning driver Eddie O'Donnell's (no relation) Duesenberg at the 1916 Corona road race, their car achieving an average speed of 85 miles per hour (137 km/h), a truly terrifying speed for those early days. Murphy rode with some of America's greatest drivers of the time, including Ralph DePalma, Harry Hartz, Eddie Rickenbacker, Peter DePaolo and Tommy Milton. After the war, Murphy's career as a driver was spotted, but he showed promise to those who knew "the racing game." Through the influence of Duesenberg's Number One driver, Tommy Milton, Murphy was given a factory car to drive in the inaugural race at the Beverly Hills Speedway, a superfast, 1.125-mile (1.811 km) high banked, wooden speedway. To everyone (except Milton's) surprise, Murphy won that February 14, 1920 race. He went on to win regularly and became a popular champion on the circuit. In 1921, as part of a team of Duesenbergs sponsored by French immigrant Albert Champion, he became the only American to have ever won a Grand Prix race in a truly all-American car, by winning the French Grand Prix at Le Mans. The next time an American driver would win a Grand Prix in an American-built car would be 46 years later, when Dan Gurney won the 1967 Belgian Grand Prix. Additionally, in 1967 Gurney became the second American driving an American built car to win at LeMans when he won LeMans that year also. So since the 1921 French Grand Prix was raced on the LeMans course, Gurney was the second American driver to win LeMans driving an American built vehicle. The feat of an all-American Grand Prix victory has not been repeated, nor it is likely to be. Murphy's mechanic in that race was none other than Ernie Olsen who also rode with Murphy in the 1922 Indianapolis 500. Murphy’s victory was not a hollow one as he was facing the best European teams from England (Sunbeam) with young gun Henry Segrave driving a 1921 Grand Prix car and France (Ballot) led by the experienced Jean Chassagne. In 1922, Murphy won the Indianapolis 500, in the Le Mans winning car, which had been modified for the Indy race and was powered by a Miller engine. He also became National Champion that year. Murphy won the final Universal Trophy Cup Race, beating Milton, at both Tacoma Speedway and the Uniontown Speedway board track in 1922. In 1923, Murphy placed second in the National Championship, even missing several races to go to Europe and race for Los Angeles race car builder, Harry Miller. He placed third in the Italian Grand Prix at Monza that year, in a race whose Grand Marshal was Benito Mussolini. Mussolini gave Jimmy two German Shepherd dogs as Jimmy loved dogs. Murphy's success continued in 1924. Murphy finished third in the Indy 500, and by the last weeks of the season, he had accumulated an unbeatable lead in the points toward the Championship. He was inducted into the Motorsports Hall of Fame of America in 1998. Although not an accomplished dirt racer, he agreed to appear at a race promoted by a friend, at the Syracuse, New York fairgrounds dirt track on September 15, 1924. As he charged for the lead late in the race, his car slid sideways and crashed through the inside wooden rail. A large piece of the rail was pushed through Jimmy's chest, impaling him and killing him instantly. Information on Jimmy's life has been gathered from various sources, including the original record books of the old AAA's Contest board, from newspapers of the time including the San Francisco Chronicle, the San Francisco Examiner and the Los Angeles Times; from the annals of the Roman Catholic Archdiocese of San Francisco, Mr. Jerry Grant of the Champion Spark Plug Company, and the public relations department of the AC/Delco Division of General Motors, as well as a personal interview with the late Mr. Peter DePaolo, who was a contemporary of Jimmy's. 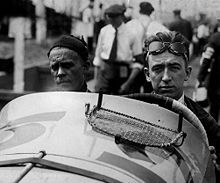 Wikimedia Commons has media related to Jimmy Murphy (racing driver). ^ "Indianapolis Motor Speedway". Retrieved 22 July 2012. ^ Capps, Don (29 March 2010). "Automobile Racing History and History". Rear View Mirror. 8W. Archived from the original on 9 June 2011. Retrieved June 9, 2011. This page was last edited on 21 March 2019, at 23:59 (UTC).